Scoring 1, Baton Rouge-Jon Sturgis 11 (Mike Rucinski; Josh Mizerek) 17:22. Penalty Ronalds Ozolinsh, BR (Holding), 10:06. 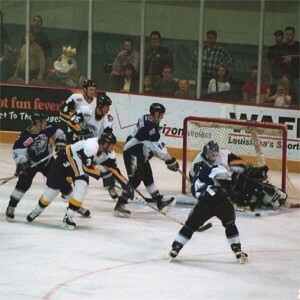 Scoring 2, Baton Rouge-Chris Chelios 3 (game winner) (Jay McKee; Mike Rucinski) 1:29. 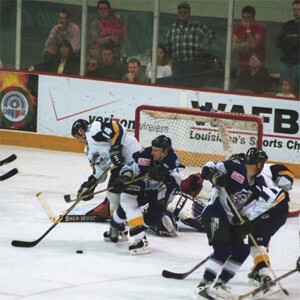 3, Baton Rouge-Ronalds Ozolinsh 1 (power play) (Cam Brown; Jay McKee) 7:20. Penalty Thompson, PEN (Roughing), 5:41. Andy Doktorchik, BR (Roughing), 5:41. Kris Mallette, BR (Roughing), 8:36. Egeland, PEN (High sticking), 12:40. Cam Brown, BR (Roughing), 14:11. Sylvain Dufresne, BR (Hooking), 16:26. Andy Doktorchik, BR (Holding), 19:45. Scoring 4, Baton Rouge-Mike Rucinski 13 (short handed) (unassisted) 12:27. 5, Pensacola-Bes 20 (power play) (Poapst) 13:21. Penalty Egeland, PEN (Fighting, Major), 5:58. Kris Mallette, BR (Instigator, Fighting, Major, Game misc. ), 5:58. Cam Brown, BR (Slashing), 6:57. McGee, PEN (Fighting, Major), 9:53. Keith Bland, BR (Fighting, Major), 9:53. Peach, PEN (Fighting, Major), 11:01. Sylvain Dufresne, BR (Fighting, Major), 11:01. Degagne, PEN (Fighting, Major), 11:57. Dodginghorse, PEN (Fighting, Major), 11:57. Cam Brown, BR (Slashing, Fighting, Major), 11:57. Andy Doktorchik, BR (Fighting, Major), 11:57. 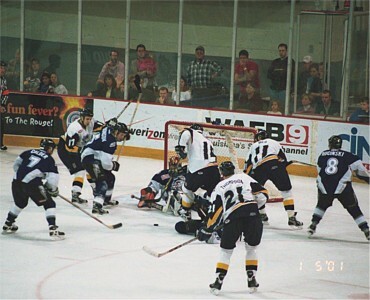 Goaltenders Pensacola-Degagne (24 shots, 20 saves; record: 11-6-2). Officials Referee: Thul. Linesmen: Ross; Kephart. Notes: Jay McKee played his first game with the Kingfish. He had a good showing in the game. Keith Bland only played a couple of shifts at the end of the game due to his injury. Cam Brown played the game with a sprained ankle he got in the LA game. 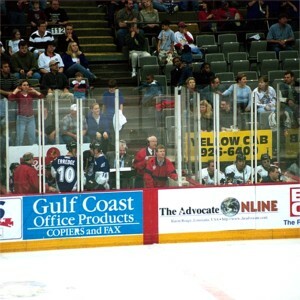 Chris Chelios played the forward position. 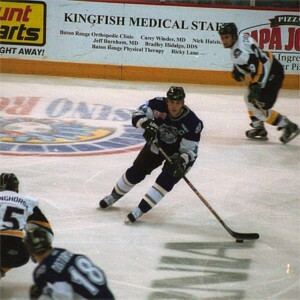 Ronalds Ozolinsh scored his first goal for the Kingfish. Kingfish are 7-0-2 in the last nine home game.